Change – Steve Travis – President P.A.L. Friday 13th may be a bad superstitious day for some, however in London’s Trafalgar Square incredible things happened this week. 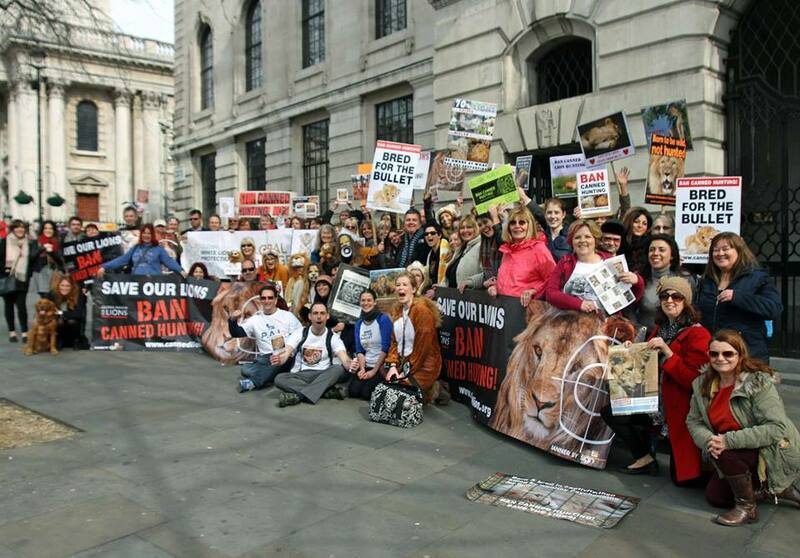 The Global March for Lions 2015 (GM4L) was a unified voice for change demanding an end to the canned hunting trade, the ban of trophy hunting imports or exports anywhere in the world and an opportunity for mankind to protect the lion from extinction. The GM4L was collectively supported by a number of NGOs and a fantastic vocal army of Lion Warriors. Our united voices were heard loud and clear by representatives in the South African Embassy across the road. Not since the call for the end of apartheid have so many congregated, chanting, calling for South Africa to make amendments to their laws, in this case, to ban canned hunting in their country. We make a further call on all airline operators to take a stance in agreeing NOT to carry Wildlife Trophies in their air freight. These barbaric practises have no place in our world today. They are 19th century “sports” being played out in the 21st Century using the last remaining populations of a number of species as bait. To permit a species to be driven to the point of extinction is irresponsible of us as a race – This is not humanity’s finest hour. Australia has taken the brave step of becoming the first country on the planet to ban the import of animal trophies. This precedence is a very clear message to other countries that they should follow suit. 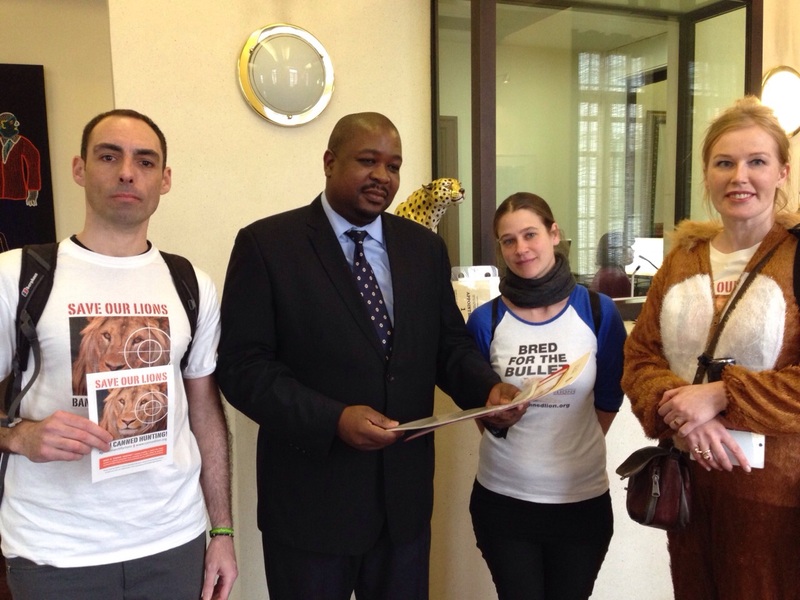 A petition calling for a ban on canned hunting in South Africa was hand delivered to an official from the South African High Commission. “It was powerful, hearing the chants of the crowd outside echoing right through South Africa House!” said Paul Tully from the Campaign Against Canned Hunting. 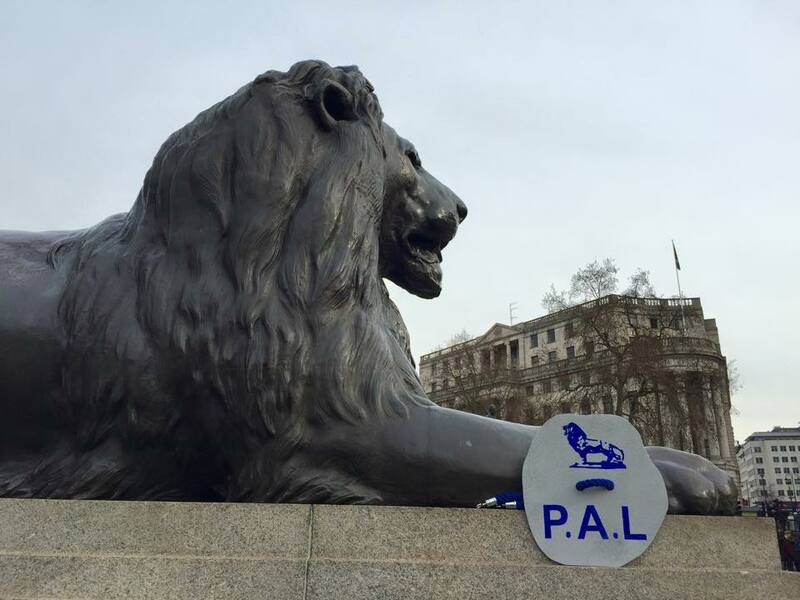 Under the watchful gaze of Britains most iconic lions, campaigners from NGOs and fellow lion warriors shared their passion, their achievements and their beliefs in a future without canned hunting. Click HERE to experience the day in our own words. It has been a while since my last blog, for this I apologise. Life has been hectic and things are going from strength to strength with the Charity Foundation. This is great news for the worlds lions. So, why the theme of this blog entry? Well it is quite simple really. I am at a stage where the great work being done by a number of people to help save the last remaining lions is being undermined by narrow minded, ill educated, egotistical morons, who think they are leading experts on conservation (some of them having never actually been to Africa or seen a lion in the wild, let alone knowing anything about them). I am NOT a lion expert, but I have dealings with many of the worlds leading experts, those who physically work with these majestic animals daily, those who have studied for years and are qualified to talk about them and make educated assessments on what should be done to protect them. I utilise their knowledge to further my education and the direction our foundation takes in its quest to Protect African Lions. I participated in last years Global March for Lions because I believed in the cause we marched for because we made a difference and were noticed internationally. Interestingly, some people have become a little carried away with their involvement in said march and think they are the fount of all knowledge these days. They think because they participated in the march that they are the world leaders. They believe their opinion is the only one that matters and they further believe they have the right to bad mouth others, through social media and in private messages and emails. Well, guess what? Libellous claims, of which I and others have a multitude of evidence, will eventually bite these folk in the rear. Nothing like a solicitors letter landing on their door mat to finally wake them up from their misguided self importance. The thing that frustrates me the most is the fact that their hearts (i believe) are actually in the right place (in terms of caring for lions / wildlife) however their methods and motives are just appalling. Each NGO has their way of operating which they chose when they set themselves up. Its not up to individuals to pass judgement on these Orgs if the individual has a personal issue with others, or is in fact misguided, or has no understanding of what the Orgs are actually doing daily. So instead of passing judgement, perhaps speak with the Orgs to gain an understanding of their work? But no, this would expose their ignorance, so they knock instead of supporting. Protecting African Lions Foundation (PAL) of which I am President, has made two public donations in the past 8 months to Orgs directly involved with lion projects on the ground. Furthermore, 98% of PALs work is actually done quietly behind the scenes, leveraging the relationships our ambassadors have with those who matter in governments across the globe, in conservation, in land ownership in Africa. Through intellectual connectivity, we meet and discuss the plight of the lion with numerous people on a daily / weekly / monthly basis, eliciting their support, donations and ongoing connections as we work to our ultimate goal – sponsoring a fully serviced sanctuary for lions in Africa. The sale of every PAL bracelet goes straight back into the foundation and is what has funded our two projects in the past year. Do I need some jumped up persons, so full of self importance, bad mouthing the good work my team and I do daily? I certainly don’t, especially when said persons fail to have the balls to talk to me face to face directly, and make waves in private underhand messages. 6 Lion charities have been exposed via social media as being fake fronts in the past year, fake domains collecting charitable donations from the public by playing on their goodwill for lions. There are currently two websites, a Facebook page and an Instagram account with a vast number of followers, who are actually fronts for collecting donations, which no lions will ever benefit from. Through our network of ambassadors, we continue working behind the scenes to have these shut down and removed from social media. If an NGO fails to publish its Charity Number, do NOT Trust it. If any fail to answer your questions as to where the funds donated goes, do NOT trust them. So time and resources that should be spent on lions is actually being redirected to halt the growth of these illegal NGOs. The lions and our wildlife are having a hard enough time as it is and we certainly do not need illegal sites popping up and taking well deserved lion funding. Most of all, with the state of the worlds lions as bad as it is, the last thing we (any of us) need is so-called do gooders causing rifts between bone fide NGOs across the globe. What we should be doing is mutually supporting each other, educating, learning from each other, growing together and unifying our call to action. Ban Canned Hunting, Ban Cub Petting, Ban Walking with Lions, Close down all the ugly volunteering operations in Africa. EDUCATE, EDUCATE, EDUCATE and EDUCATE some more. No matter who is doing the educating, we must get canned hunting out there to the masses. Think about it people, harness that passion that drives you every day and actually put it to good use. Don’t waste your time, or that of others with playground antics. Man up, grow some balls and support one another. Man has an ability to put their differences aside and walk together in a common cause. FW De Klerk and Nelson Mandela proved that to be true. 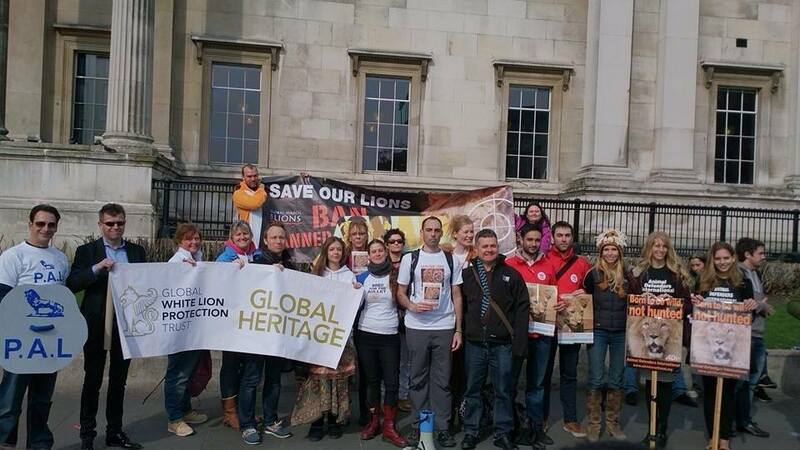 I am very much looking forward to the Global March for Lions on 13th March, a year after our initial impact. I will proudly be standing there supporting the cause so many of us will turn up for, I will not back down, I will not detract, I will support the ongoing momentum. Yesterday was World Animal Day around the globe. Concerned citizens of our fragile planet marched in cities world wide to raise the profile of the plight of our wildlife, the state of the planet and showed solidarity with all those trying to do something about changing our inevitable man made downfall. I heard many slogans yesterday, chants from the voices of those trying to save our very biosphere. I was enthralled with the passion of the speakers in Parliament Square, London. Dominic Dyer, Simon Jones, Sir Ian Redmond OBE and Nicky Campbell all spoke with wisdom, compassion and fire. A fire that started a long while ago but one which is spreading throughout the world, a fire of caring, urging our governments and political leaders to do something about the Ivory Trade, about Canned Lion Hunting, about the state of our oceans. With the stroke of a pen this could all be resolved. A big statement yes, but the reality is that by sliding that biro across a bill in parliaments around the world we can actually ban the trade in ivory, ban the import of lion parts into Europe, the United States and the rest of the world. It truly IS that SIMPLE. Ian Redmond spoke of Elephants being the gigantic keepers of the forest. Essentially, without elephants pruning trees, depositing a weekly ton of dung filled with seeds for new life the actual fabric of the forest, of the bush veld, will change and be lost forever. Every species on this planet is here for a reason, yes, even the apex predator the Lion. They are top of the food chain, they control population in the wild, they are our planets gate keepers. If we stand by idly watching a species disappear from the planet, our very planet will be at risk. The make up of it, the equilibrium, the ecosystem will change forever. I call on all governments across the globe to step up and prove your worth. Sign off the bill to ban ivory trade in every form. Sign off every bill that is put to your government that aids the protection of our wildlife, our heritage, our future. If you can find billions every year for international aid efforts, many more billions for war, make a stance and set aside a few billion to educate those who think rhino horns, tiger bones or shark fins are good for your libido. Step up and utilise social media to get the message across to the youth in China. They are the biggest non violent highly effective movement in the world at the moment. Use them to educate those who think a lion carcass or an elephant tusk looks good on the floor in their offices or as a carved trinket for sale. Use these same harbingers of change to help educate those who hunt whales, endanger dolphins and the list goes on and on. I call on YOU, China, to sign into law the banning of ivory trade with severe custodial consequences for those caught dealing in this material, close the ivory carving factories, re-appropriate the staff there to doing good for your and my environment. South Africa, President Zuma, I call on you to finally outlaw canned hunting, and to ensure that you set aside sufficient funding to have those 8,000 lions in captivity sent to protective custody on game farms and sanctuaries, for them to live out their days on this planet. Sign into law the ban on hunting any wildlife species, particularly this that are endangered. I implore you to stand up and actually do the most effective thing you can do for your country, support the ban on canned hunting, support having the lion listed on the CITIES endangered species list at the convention in South Africa next year. Stand up and employ thousands of your unemployed citizens, train them, develop them and use them to help conserve your heritage, your environment and your reputation. You cannot be a puppet all your life, man up and make a stance. To all those in the United States I call on you to make the changes in your laws that will help protect our wildlife. Just because you’re a big country does not give you the right to go kill endangered animals on another continent. How would you like it if the rest of the world came to the USA and shot your buffalo? (Have you got any buffalo left?) 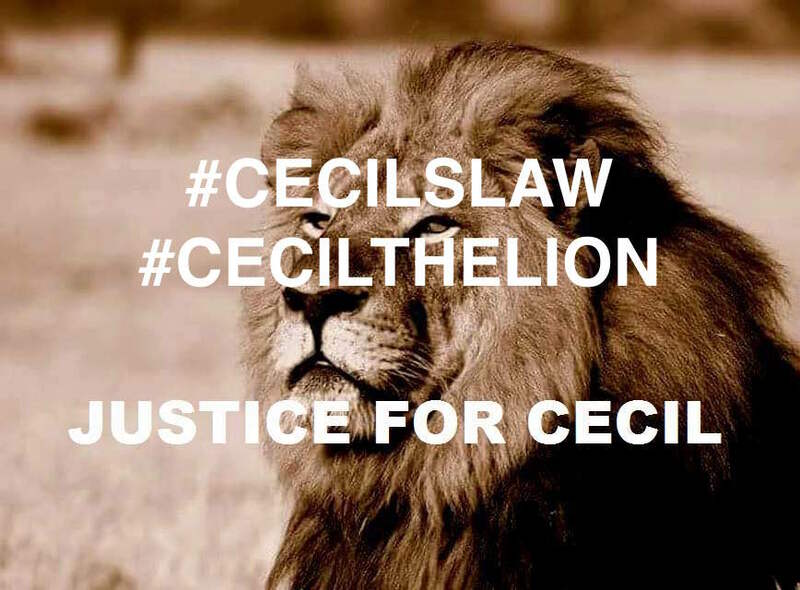 You can make the biggest difference to the plight of the lion by changing one simple law. The import law that allows you to bring lion trophies into the United States as personal items, not as an import. Goodness me, you confuse me. I cannot even bring an apple into your country when I visit, how the hell do you let a lions head trophy in with no regard? I further call upon all those fantastic organisations around the world all working in the interests of conservation, preserving our wildlife, to actually support one another, stand by our common goals and present a united front. The barrier would be far easier to pull down together then individually. United we must stand. Despite all this, I am in a happier place today. Happier because i witnessed the people who will no longer stand for this. They are not government officials or radical activists, they are normal compassionate human beings who are making a stand for our wildlife, for our environment and for our very existence and for that, I salute you all.